Earlier this week, director David Ayer tweeted a photo of the cast of Suicide Squad, which included everyone from Will Smith as Deadshot to Lost’s Adewale Akinnuoye-Agbaje as Killer Croc. Wolf Of Wall Street’s Margot Robbie was there too, filling the Harley Quinn role in a roster that we swear isn’t dedicated entirely to Batman villains. But speaking of Dark Knight baddies, Jared Leto, who will portray The Joker, wasn’t pictured because he was off doing research for the role by wearing makeup and screaming in people’s faces. In other words, he was on tour with his band Thirty Seconds To Mars. 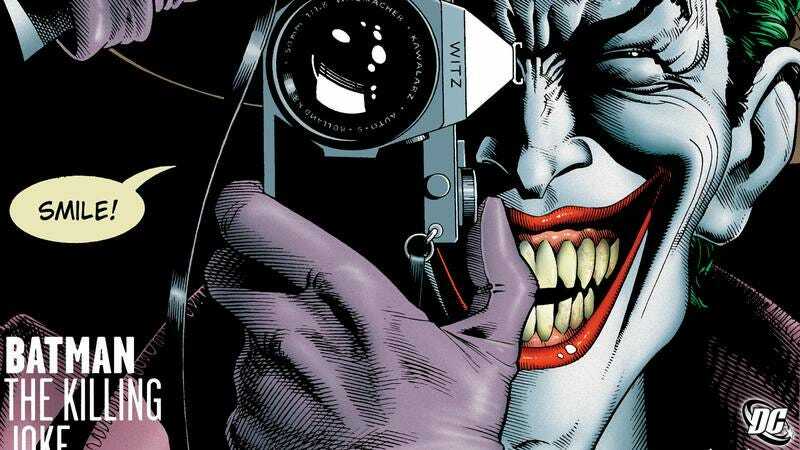 However, Ayer didn’t want to cheat us out of a teaser photo of the Clown Prince of Crime, so today he tweeted an image of Leto in a pose similar to the cover of Alan Moore and Brian Bolland’s classic comic The Killing Joke. Is that a hint of green in Leto’s hair? Maybe it’s the lighting, or maybe it’s this laughing gas we’ve been huffing. Anyway, as cool as this image is, the more exciting notion is that Leto and Ayer will draw on The Killing Joke for their interpretation of the Joker. Of course, Tim Burton also loved that comic, and he ultimately decided that the Joker killed Batman’s parents. So there’s always room for artistic freedom, and for the internet to fervently denounce that freedom. Suicide Squad is set for release on August 5, 2016.